In the early hours of 11 May 2017, a statue of Jefferson Davis (the president of the Confederate States of America during the Civil War) was removed in New Orleans, the second Confederate monument to be uninstalled in the city. Due to the risk of repercussions, crews wearing masks and protective helmets arrived in the dead of night with no warning or announcement, and the company name on their truck had been blacked out. 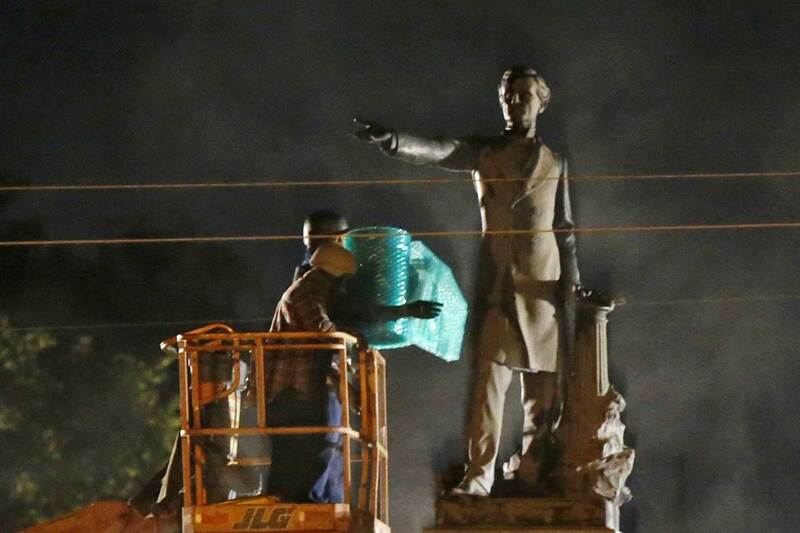 The monument was protected in bubble wrap, attached to a crane and lifted off its plinth. The city also did not announce either statues’ removal. In a statement, the city said it does not plan to announce removal plans or a timeline for the two remaining monuments — P.G.T. Beauregard at the entrance to City Park and Robert E. Lee at Lee Circle — due to the “widely known intimidation, threats, and violence.” … Monument supporters — who have camped at the site for the last two weeks — waved Confederate flags across the street from the statue. Supporters and opponents were separated by barricades, similar to how NOPD organized protesters at Lee Circle on May 7. The debate was so contentious that another monument, which had been installed to honor the anti-integration Crescent City White League, had to be removed in the dead of night “by crews wearing masks and body armor,” according to reports. Three weeks ago, we began a challenging but long overdue process of removing four statues that honor the ‘Lost Cause of the Confederacy.’ Today we continue the mission. These monuments have stood not as historic or educational markers of our legacy of slavery and segregation, but in celebration of it. I believe we must remember all of our history, but we need not revere it. To literally put the Confederacy on a pedestal in some of our most prominent public places is not only an inaccurate reflection of our past, it is an affront to our present, and a bad prescription for our future. We should not be afraid to confront and reconcile our past. The City remains secretive about plans to address remaining monuments.